Bubble Run Christmas Edition 2016 | JustRunLah! Early Bird Registration gets P100 discount and Santa Hat if you register on or before October 24. 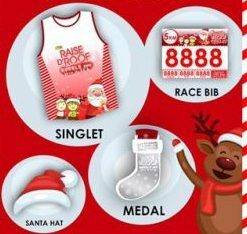 Something bubbly is happening this Christmas, Raise D’Roof Bubble Run ‘Christmas Edition’ is happening on December 18 in Blue Bay Walk Macapagal. This race is for the benefit of Elsie Gachers Village Inc.